Former Charlton goalkeeper Jordan Dawes, who was diagnosed with liver cancer in November after suffering a stroke, has died aged 18. Dawes played for fifth-tier side Kent Football United earlier this season. She received well wishes from the football community, including Manchester United goalkeeper David de Gea, following her diagnosis. "We are heartbroken beyond heartbroken," a family statement said. "She had so much life to live. Never stop loving and hugging your beautiful children as it's a cruel world out there." Several leading WSL players and England internationals, including Chelsea's Fran Kirby and Manchester United Women manager Casey Stoney, sent messages of support to Dawes on social media following news of her illness. 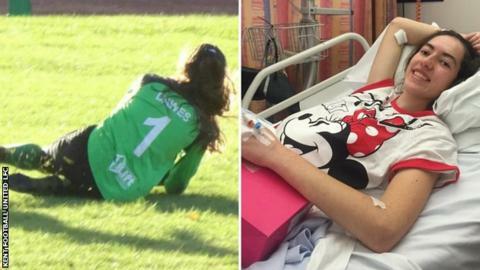 A crowdfunding page that was set up to help pay for her treatment has passed more than £8,500 in donations.